I’m very excited to be co-hosting a new blog hop with the wonderful Alex of A Moderate Life. Just enter your link below, Follow me on Twitter and ‘Like’ The 21st Century Housewife on Facebook. You can also follow this blog and /or follow me on Networked Blogs, by clicking on the 'follow' buttons in the sidebar of this blog. I will follow you back. Visit as many other blogs as you like, to make new friends and follow their blog, grab their tweets and RSS feed if you do not already. If you do grab their info, please leave them a comment so they know they have a new friend. 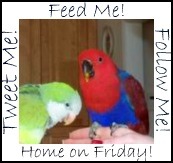 If someone visits you from Feed Me, and grabs your info, please return the favour - it's a great way to increase your followers and promote your blog! Looking forward to meeting lots of new friends! Thanks for hosting! I linked directly to a recipe today. I hope that's OK! Have a delicious weekend. And Happy Valentine's Day. Thanks for linking up ladies! And yes, it's perfectly fine to link directly to a recipe, no problem. Have a great weekend, and Happy Valentine's Day!